brandflakesforbreakfast: sodas don't shake hands, sodas gotta hug! sodas don't shake hands, sodas gotta hug! Give a hug, get a Coke. It's that simple. 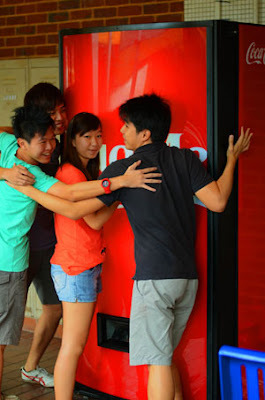 Ogilvy & Mather Singapore created a vending machine that says "Hug Me" on the front and rewards people with a Coke who do just that. So simple. So cute. Have they just created hugeractive marketing?